Thanks to the smartphones, which let you carry your music wherever you go, and if you are a music lover then you won’t enjoy the experience on your smartphones speakers or earphones. That’s where portable wireless speakers come in. They let you enjoy great music without physically connecting an audio player with a cord. 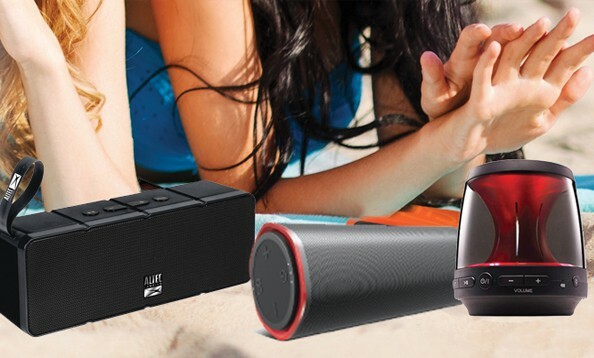 Here’s a checklist of what to look for in portable speakers. There are quite a few personal wireless technologies apart from the Bluetooth, so check what all does a portable speaker support. Here’s a quick overview of these wireless technologies. This, of course, doesn’t require any introduction as it’s the most popular wireless technology for device connectivity. The latest version is Bluetooth 4.1, which offers higher throughput and greater battery efficiency. speakers, NFC simplifies device pairing over Bluetooth. All you need to do is tap the device to the speaker to complete the pairing. This technology is not compatible with iPhones. devices over a Wi-Fi network. Many wireless speakers now feature this technology and if you have an iPhone, iPad etc, then you can easily stream music with it, but it only works with Apple devices. you can access and stream media. Bluetooth remains a much better choice over this. becomes critical if you want to setup a multi-room home audio system. However, keeping in mind the portable nature of the product, Bluetooth is sufficient enough to serve most of the purposes. Controls for volume, mute and track advance help you control your media playback and also to answer/end calls with a built-in speaker phone. portable speaker, the range of frequency response is the most important factor to consider, apart from the sheer output. Usually, all portable speakers have their max frequency response level set at 20 KHz. So, you should consider the minimum level if you are looking for a thumping sound. Lesser the minimum response rate, better the sound. Here are the specs to check out and what to look for in them. Sensitivity: This is expressed in decibels per milliWatt (dB/mW) and signifies the level of sound produced by headphones in response to a 1mW signal. In simpler terms, it is used to determine the amount of power required to drive a speaker. Quite simply, more the sensitivity, better the output. Frequency Response: FR is usually represented in a ‘range’. Human listening range is between 20Hz to 20kHz. A 20Hz of frequency would mean very heavy bass and 20kHz would mean a very high pitch sound (treble). The FR range of an audio device depicts the output of a speaker. For eg: If a speaker’s frequency response is between 20Hz to 200Hz – it would mean that this is a sub-woofer with a heavy bass. If a speaker has a frequency range of 19kHz to 20kHz, then in all probability it will have a very high pitch sound. A speaker with a very high range would mean that the speaker has the capacity to throw all three: bass, treble, and vocals very clearly. Impedance: Technically, this does not play a big role in considering the sound quality of a speaker. This has more to do with the compatibility and power required to drive the speakers. For instance, how far your speakers can be stretched before they are over-driven. Products like headphones usually have higher impedance value (32ohms) and products like home theatre speakers and portable speakers have low impedance value (2, 4, 8 ohms). Shape, Design, and Housing: Design is more for an aesthetic feel, so preferences differ. However, the shape and housing of the speakers play a major role in sound quality. The correct positioning of the speakers (placed acoustically) needs to be factored in. Sometimes, despite having best of the specs, incorrect placement ruins the output quality. Wooden Housing: Since wood absorbs vibrations, headphones with wooden frames give good clarity and reverberation. Plus, they have more controlled sound pressure. Metal Housing: Portable speakers with metal frames provide rigidity and great look & feel. Mostly, aluminium housing is used as it is lightweight and easy to work with. Moreover, it provides sharper audio signature than the plastic housing. Metal casting for portable products could be a dampener as it hampers the sound quality. However, correct positioning of metal in overall plastic casing should provide an adequate sound experience. Do You Need a Sub-Woofer? Usually, portable speakers do not have sub-woofers. Good subs require adequate power. Consumers need to look for bass radiators or bass ports while reading the specs. Extra features in portable speakers do matter while making a buying decision these days. Base ports or base radiators are key things to look at. Remote control is not a selling point since they are already portable devices. Other key features like speaker phone and power banks definitely come in handy if you want to carry a good portable speaker while travelling on a business or leisure trip. Portability is not enough. You also need durability so that the speakers don’t get damaged when you’re on the move. of the speakers. Some speakers tend to slip when kept on a smooth surface and are playing bass heavy tracks. The best is wood for its durability, build quality and sound experience. enthusiast, then spend a few minutes listening to bass heavy music. The sound shouldn’t crack at high volumes. In some cheap speakers, we’ve heard noise creeping in after playing for a couple of minutes. camping trip. These types of speakers feature a USB charging port that can even provide extra power to your smartphone or tablet. Some Bluetooth speakers are equipped with a microphone for hands-free conversation. When a call comes in on your paired smartphone, it automatically routes to the speaker, which gives you the option of accepting the call or continuing to listen to your music. delivered on full charge. Portable speakers make you enjoy your favorite tunes on the go. Whether you are in an outdoor party, sharing audio with friends, watching movies or out on camping trips, they serve as a perfect companion. Thanks to new technology our activities wouldn’t be so boring. We should also consider the features and quality of wireless speakers before we purchase.